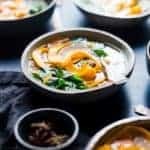 This Crock Pot Paleo Chicken Noodle Soup has a Thai spin! It uses butternut squash noodles so it's gluten and grain free and perfect for cold evenings! Add all the ingredients, up to the star anise, into a 7 quart slow cooker and stir together. Place the star anise pods into a tea ball and fill up an additional tea ball with black peppercorns (no need to measure - just fill it.) Place them into the slow cooker. Pat the chicken thighs dry and rub the Chinese 5 spice all over them. Place into the slow cooker. Cook until the chicken is tender, about 7-8 hours on low. Once the soup is done, stir in the butternut squash noodles and cook another 10-15 minutes, just until the noodles are tender. They cook quickly so keep an eye on them! Then, use a slotted spoon to remove the chicken to a plate. Stir in the lime juice and sriracha. Shred the chicken with 2 forks and stir it back into the slow cooker. Divide the soup between 4 balls, garnish with a pinch of each herb and DEVOUR. *I have also made this with chicken breast. It's all very good, but a little bit less flavorful. **I buy little plastic containers of lemon grass that seem to be only about half of the full lemon grass (they don't have any of the greenery at the end) so keep note of that when determining how much to use. ***You may also use zucchini noodles for a low-carb option.